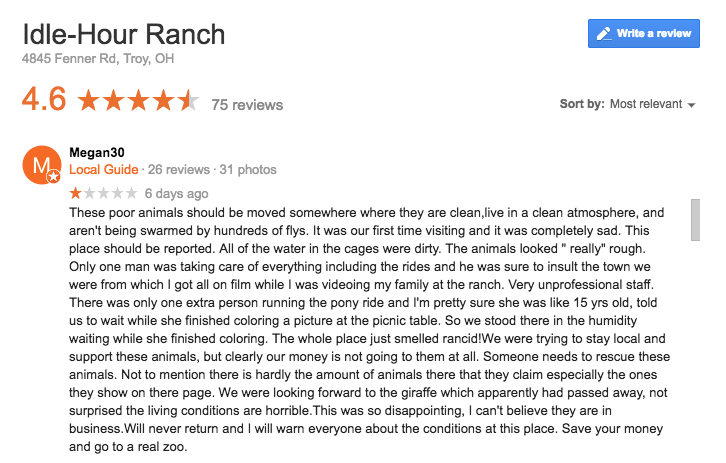 I can understand an individual having a bad experience and complaining to the management of an establishment about it – even demanding a refund or expecting an explanation … but what I cannot understand is how someone feels so self-righteous and entitled as to bypass the management and instead publicly attack people with such ignorance as is demonstrated by this poorly drafted review. Firstly, our animals are well cared for – as all of our positive reviewers have openly attested to over the last 20 years. All of our animals have a constant flow of clean water in their enclosures and their health is regularly monitored and attended to by several qualified veterinarians, who would be more than happy to refute your statements. Our animals are not neglected, nor abused, and your allegations that we are not worthy of having them is, quite frankly, detestable and deeply offensive. And how dare you bring up our beloved giraffe, Sam, in that vicious way. He was family, and losing him was a horribly painful experience for us. How would you feel if someone you loved died and an ignorant stranger who doesn’t know you or your family publicly slandered you by saying that their death was of your doing? In short, this review is utterly ridiculous and your threats are extremely out of line here. Furthermore, concerning your listed grievances… it seems obvious by your complaint about the flies that you are not familiar with what a working farm looks like and are more conditioned for a priggish concrete fantasy world devoid of nature, bugs, and humid weather. It’s really a wonder that you lowered yourself to visit such an ‘inferior local agricultural facility’ such as ours in the first place. Your backyard barbecues must be absolutely amazing… no flies, no bugs? Wow! And you don’t even have manure in your yard to draw them there. Amazing. We spend thousands of dollars a year on pest control and are quite happy with the results – hundreds of flies sure are better than millions. Most people could only dream of such successful pest control as that around their home this time of year. As for our staff – you were kindly and professionally cared for just as all of our guests are, guaranteed. Our staff consists of volunteers and they are not rude, nor unprofessional – after all, these are people voluntarily taking time out of their day to support our mission in providing quality service to our quests, and care for the animals. They have no reason to insult guests or act unprofessional towards them – though they have every right as human beings to defend themselves as needed against unreasonable and discourteous individuals that happen onto our private property. There were several workers at the ranch on the day you visited; not just one, as you claim. You were informed by our cashier on the day of your visit that we were short-handed for the day, but we would do our best to take good care of you and your family, and if you needed anything to please let her know directly (which you didn’t do). Our other visitors were graciously understanding of this, and they all managed to still have a good time and give positive feedback for their experience with us that day. The young girl you referred to is actually a 20 year old with a learning disability that, as an independent vendor, graciously set up at the ranch for the day with her art display and face painting stand. You were not supposed to approach her for a pony ride. The fact that she helped you at all is a testament to her kindness and good character. Had you followed the instructions the cashier gave you when you purchased the ride tickets then things could have perhaps gone more to your liking. This is why following the directions of your host is so important. In addition, I find it very surprising that you chose to stand out in the humidity to wait when you know perfectly well that we have a wonderful, air conditioned gift shop with seating located directly next to the pony ride ring. After all, you were standing in it when you purchased your tickets. Seems the entirety of this complaint simply comes down to you having made bad choices. As goes the saying that my family raised us with… “Don’t be mad at us for something that you chose to do.” In other words – You make a bad choice, you have no one but yourself to blame when the consequences come your way. The “rancid smell”, as you put it, is actually caused by the musky odor of the fox we have on exhibit at the ranch. You must have overlooked the sign there that explains this, and how it is an odor that often increases during wet and humid weather conditions despite the area’s daily cleaning routine. If we discriminated against certain species of animals based on their odor or other offensive traits/habits then there would be nothing for people to come here and see. Fortunately for our animals, we are not so easily offended by their natural existence and the majority of our guests are happy to embrace this growingly rare opportunity to interact and learn about these animals, rather than complain about them. As for us “not having as many animals” as we show on our page… fact is, every animal species listed on both our social media and website was on display for you that day. If you did not see all of them then that is no fault of ours. In addition, I’m curious as to how it is possible that you visited our page and saw anything about our giraffe, Sam, without also seeing the large bold-font notice there that clearly states that he is no longer with us. You know that picture of Sam with the words “In Memoriam” on it, followed by the lengthy story about him?…. yeah, that means he’s no longer on public display. Semantics are amazing, aren’t they. Imagine that you have acquired a very old, run down property with a fixer-upper house on it. It doesn’t look like much, and everyone says that you’re crazy to have it, but deep down inside you have a vision for it and you love it. So you spend the next 20 years of your life turning it into something beautiful. That’s 20 years of your life, mind you. Through good times and bad times. Years of hard labor, and sometimes with little to no income for your family. Blood, sweat, and tears invested. Literally. But you’ve got kids to raise and someday put through college so you keep building your dream. You work multiple jobs. You work and work and work. Nothing is handed to you on a silver platter. You keep persevering no matter how hard times get. Then, finally, one day it’s manifested. It was hell to make it real, but now no one says you’re crazy anymore. They finally see your vision, and now they love it too. You have made a beautiful home. It might not be much to some, but it’s absolutely everything to you. It’s literally your life’s investment. Your work, your life’s savings, and the most precious investment of all – your time. You’re proud of what you’ve accomplished in the face of such adversity, so you invite people to come and enjoy the fruits of your labor. To see how beautifully you’ve built your dream. You feel it’s too good to keep all to yourself. You want others to enjoy it too. So your invited guests come. It’s their privilege to be there, not their right. They walk in the door and you greet them warmly. They have no idea what it took for you to put that door there for them. But that’s not important. They don’t need to know the details of the last 20 years. Just enjoy the results of the present. After all, your personal life is none of their business. Your guests mingle and partake in all that your home has to offer and when you ask them if they had a good time they all tell you that they did and then part ways with a smile. This absolute stranger who knows nothing about you takes it upon herself to don a self-righteous critic’s cape and publicly claim that your home is disappointing in her opinion, and not only dirty but even the smell offends her too. She goes on to say that she filmed your family and friends while she was there and, ultimately, verbally bashes them because she feels they didn’t cater to her quite to the level of her entitled expectations. She could have voiced her concerns to you before she left your home, or contacted you privately – but instead, she chose to dramatize her ignorance in a self-paraded public spectacle. You are then forced to give public explanations that are really no one’s business, but this inconsiderate stranger is too self-absorbed to consider how her careless slander affects your life and the hard work you invested into the place she deems so unworthy of her presence. Then she goes even farther. She announces *publicly* that your living conditions are so deplorable that you should be reported and your children should be taken away from you. Do you live immaculately and never offend anyone around you? It’s so easy to judge others when you have nothing invested in walking their path. By all means, please invite me to your home Megan30 so I can leave a very public review about your home, your life, your family, and your incompetence as a human being – after all, I have a critical eye too and my opinion deserves to be heard as much as yours. And if you’d really like to wear that cape of yours how about you put your time and effort and money where your mouth is rather than be just a faceless keyboard crusader? If our home and operations are so unworthy of continuation, then here is your official invitation to come to the ranch and change everything that you find so deplorable about it with your very own hands and your very own money. We’d love to have the help for a change, rather than faceless criticism. You can pay for the tens of thousands dollars for supplies to build the barns, then with your own two hands you can go out and build the fences like we do – you can go out in the fields on the hottest days of the year and bale the 8,000 bales of hay and straw we personally harvest and use every year – you can buy the hundreds of thousands of dollars of farm equipment, and you can harvest the oats that the animals eat – you can pay the tens of thousands of dollars for the other bagged feed, supplements, and vaccines that the animals need in order to stay healthy – then you can go out and feed the animals twice a day every day and never take a vacation for 20 years – you can work three jobs to make up the lack of funds coming in the door during the 299 days of the year that the ranch is not open to visitors – you can clean the hundreds of pounds of manure by hand every day and hoist it over your head into the manure spreader and haul it away so guests aren’t looking at a fly-breeding manure pile on the property (you didn’t even notice that we don’t have a manure pile on the property, did you) – you can pay $35,000+ in vet bills every year to make sure the animals are healthy and well cared for – you can stay up all night administering medicine to a sick animal and worry yourself sick about the outcome – you can deal with the emotional trauma of loving and investing yourself into hundreds of pets that have a significantly shorter lifespan than your own – you can pay the exorbitant insurance, the $2500 electricity bill every month, the farrier bills, the pest control bills, the sheep shearing bills, the property tax, the tens of thousands of dollars a year for property upkeep, maintenance, and improvements, etc. — all of this, and more, in addition to taking care of your own family’s needs – and best of all, you can deal with the individuals like yourself who spend $12 one day and suddenly think that they are entitled to say out loud any ignorant thought that enters their daft mind. You honestly believe that we don’t put your piddly twelve bucks to the care of the animals? You cannot possibly be serious. Do the zoos and local businesses a favor and just stay home. They most assuredly don’t want to deal with that witless chip on your delicate shoulder either.